Top seed Steve Coppinger took the $35k title with a 11/8, 8/11, 11/7, 11/3 win over Ryan Cuskelly, collecting his 9th career PSA title. "Very happy with my week in Charlottesville," said Coppinger. 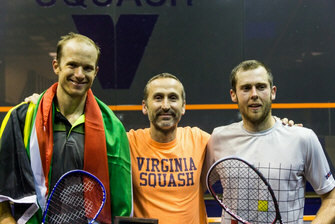 "Ryan has also been playing great squash and made it very difficult in the final. Thankfully I had a bit more left in the tank and was able to pull away in the end. "Huge thanks to all, especially the crazy South Africans (my family included) who stayed up till the early hours to follow on the live streaming." 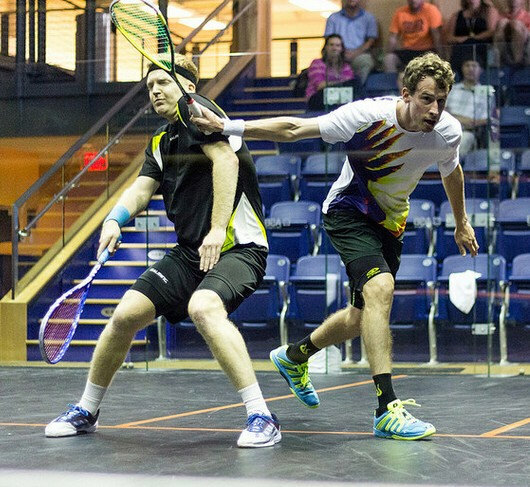 Straight game wins for Ryan Cuskelly over Ali Farag and Steve Coppinger over Campbell Grayson and the final i set in Charlottesville. 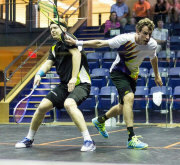 Quarter-finals at the Boar's Head Club in Charlottesville started with two 'local derbies' which both produced upset results as Ryan Cuskelly and Ali Farag advanced to the semi-finals on five-setters. Second seed Steve Coppinger had no such troubles as he won in straight games, and unseeded Kiwi Campbell Grayson ended home hopes as he beat US qualifier Chris Gordon. A hot and sticky day made for a long and physically tough battle between the two Australians. With little reward for taking the ball in short it was a long and scrappy affair, punctuated by plenty of lets and strokes (going in both directions). Pilley looked like he’d done enough to secure the victory with two match balls in the fourth, but couldn’t finish on either. He had another couple in the fifth too, but it was Cuskelly who took the match, and with his first opportunity. It was a harsh finish for Pilley, with a stroke against for 9-10, followed by a no let at 10-all, and followed by another stroke against on match point – after battling hard for over 110 minutes it was a very unfortunate way to end. Another tight match, this time 13-11 in the fifth game, and ending on a stroke just like the first match! Throughout the match Gawad was always pressing forward and so strong around the center of the court. But Farag absorbed so much of what was thrown at him, and landed plenty of effective counter punches to always keep himself in contention. You could tell the two of them have been competitors for years; it was tight all the way without either play ever edging more than 3 points in front of their opponent from start to finish. Gawad had three match balls and a strong opportunity to finish on the third one of them, but his short ball into the front right off a poor serve return from Farag clipped the tin by millimeters. Farag then took the next two points to close out the match. Second seed Steve Coppinger came through 3/0 in 49 minutes and always looked the likely winner. His line and length into the back two corners of the court was superb tonight, hitting hard and low, barely clipping the side wall, and hardly ever over hitting – not an easy thing to do on this hot glass court at UVa. As a result Clyne struggled to get any kind of foothold in the match, and became increasingly frustrated. In the final match of the day Campbell Grayson, unseeded the New Zealander who had beated the fourth seed in the previous round, ended home interest as he beat qualifier Chris Gordon in four games. After a rest day following completion of qualifying, round one got under way at the Boar's Head Club in Virginia, where the crowd quickly saw two big upsets. 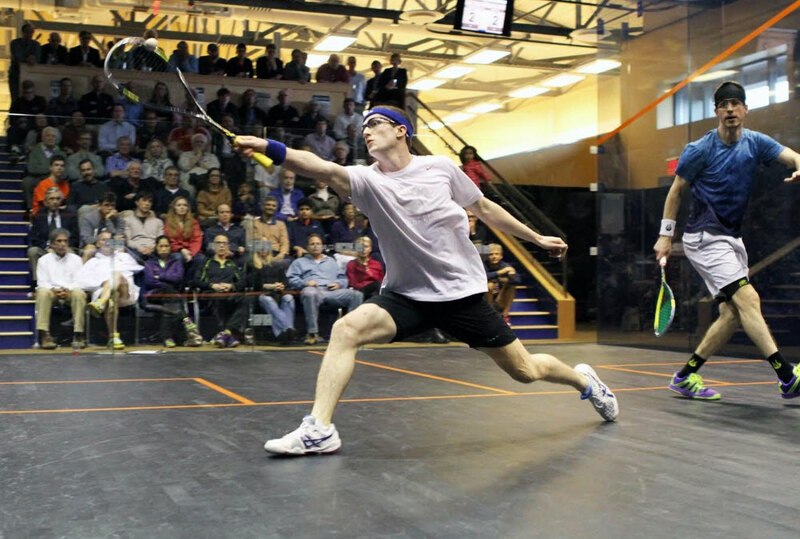 New Zealand's Campbell Grayson beat fourth-seed Alister Walker in four, and then American qualifier Chris Gordon came from two-one down to beat Tom Richards, the fifth seed, in five. "Campbell was too good today. I had my opportunity in the third to go 2-1 up but once that moment passed I was always behind" declared Alister after the match. A happy Campbell stated "Happy to win my match today. Never easy playing against a good friend and we know each others game well. I like the court conditions here and looking forward to my match tomorrow against Chris." Grayson and Gordon will meet for a place in the semi-finals, where the winner will face either Steve Coppinger, the South African second seed, or Scotland's Alan Clyne who ended the hopes of home qualifier Todd Harrity. 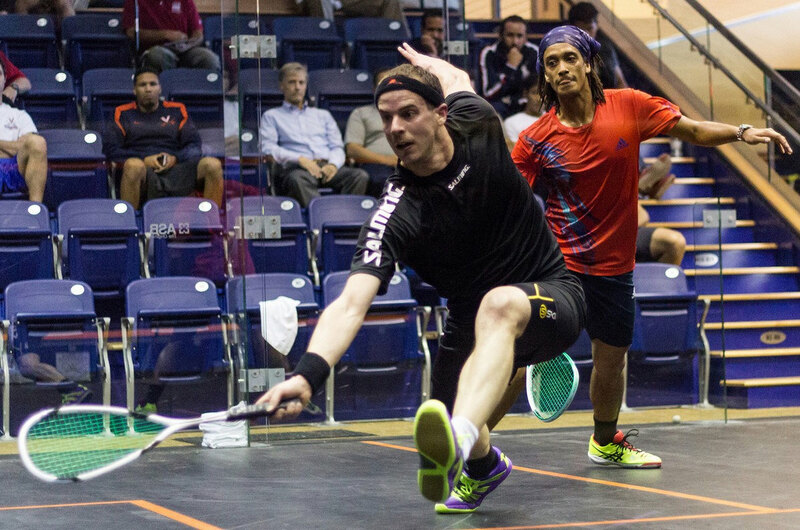 There was a further upset in the evening session when Ali Farag beat sixth-seeded Mexican Cesar Salazar in four games. Farag's reward is a meeting with fellow-Egyptian top seed Karim Abdel Gawad, who also advanced in four games as he beat wildcard Joe Chapman. "It was a good match for me and I'm happy to be competing with the top guys," said Chapman. "Lots of positives to take away from the match. Charlottesville did a great job with this tournament and I'm looking forward to spending a few days seeing the city." An all-Aussie quarter-final was set up as Cameron Pilley and Ryan Cuskelly progressed at the expense of qualifiers Arturo Salazar and Shahier Razik. "Arturo can be a very dangerous player so I had to be mentally prepared for a tough match," admitted Pilley. "He came out quite strong in the first game and hit some quality winners and took me by surprise. After losing the first game I had to up my game and increase my sharpness. I managed to do that and turned the match around to win 3-1." "Very happy to start off the season with a 3-0 win against a experienced player," said Cuskelly, "and really enjoying playing on the glass court here in Charlottesville. Looking forward to the Aussie battle tomorrow night against Pilley." Since the inaugural edition of the Charlottesville Open in 2013 the event has continued to increase in prize money and standard of play. 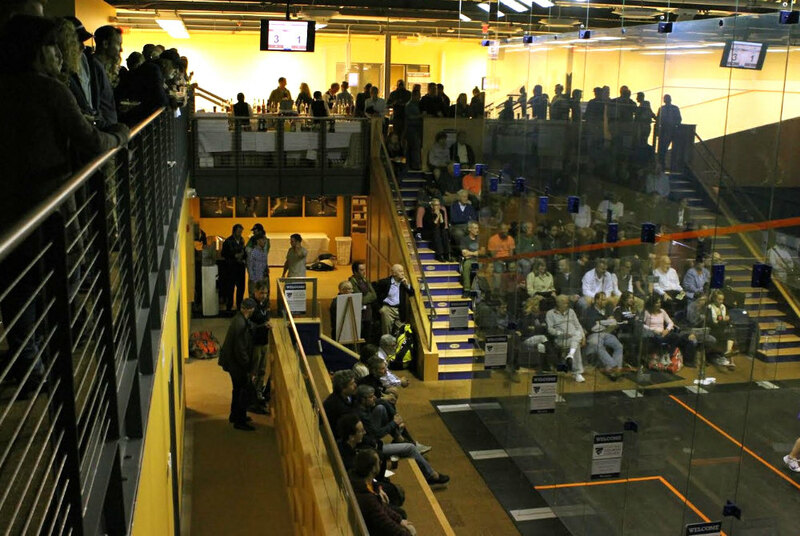 The 2015 Open features a prize fund of $35,000, with a sunny forecast for next year, when organizers hope to bring the event a level up in status to a $50,000 PSA concern. It is an event that already excites PSA players and, without a doubt, that will continue to be the case. 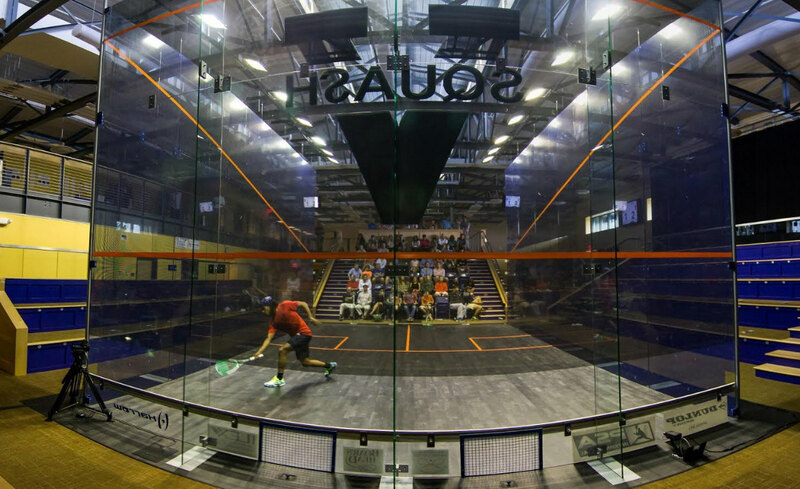 The top two seeds in this year’s event are Egyptian Karim Abdel Gawad and Stephen Coppinger of South Africa. Both have solidified their rankings in the world top 20 over the last couple of years. More experienced players on the PSA tour include Laurens Jan Anjema, who, for 12 months of his 14-year career, was ranked inside the world top 10 and is the only player in the draw to hold that honor. Third-seeded Cameron Pilley of Australia boasts a career high ranking of #11 in the world; your correspondent, that is Botswana’s Alister Walker, and Englishman Tom Richards have both been ranked as high as #12. While on paper it is hard to imagine the eventual champion would not come from one of the six aforementioned names, there are no safe bets on the current PSA tour; such is the standard and strength in depth of the current game. With the exception of Gawad’s first-round encounter, none of the players would be too surprised to find any of the seeds toppled in the first round. My pick for the most electrifying of the first round matches has to be Coppinger facing the improving Australian Ryan Cuskelly, who is more than capable of winning and going further in the draw. The winner of that encounter will likely come through a grueling physical encounter to face a fresh and tough-to-break Scot in Alan Clyne in the quarterfinal stage. Hugely athletic and technically gifted César Salazar has shown signs that he is taking positive steps to match his mental prowess up to his natural talents. If head, heart, and physique come together for Salazar, it could be a breakthrough season for the Mexican. Winning matches on the PSA tour takes steadfast resolve and he’ll need to exercise all he can muster mentally to get past Harvard graduate Ali Farag, who I would argue is the best player in the history of U.S, college squash. This Ali-Salazar match is probably my second-favorite of the first round match ups. It would be safe to assume that the players who drew a qualifier in the first round got away lightly, but I can assure you that is not the case very often on the tour. No. 1 qualifier Alfredo Avila last month came through qualifying in Bogota, Colombia to win a $50k event defeating top-10 players Peter Barker and Borja Golan en route to the title. Such a stunning run is unlikely for him being away from altitude, but he is certainly capable of an upset here in Charlottesville. The second and third qualifiers will be looking to demonstrate that they are not out of their league on the University of Virginia show court. U.S. number one Chris Gordon and National Champion Todd Harrity know the court better than most, and on home soil with good support, both should come out guns blazing with nothing to lose. Karim Gawad is probably my favorite for the title but not by much. In the past he has shown a tendency to tighten up against lower ranked countrymen and he could face Ali Farag in the second round. Gawad is approaching his peak years as a player and in order to fulfill his substantial potential will have to grow out of that phase soon. Tom Richards has been showing signs of returning to form after a couple of tough years and I would put him in with Laurens Anjema, Cameron Pilley, and Alister Walker as the main contenders. While accepting they could be upset in the first round, these experienced campaigners have shown they can win these events, won’t be short of confidence, and are keen to win more events before riding off into the sunset. Lady Luck will certainly have her say as we watch this exciting event play out!